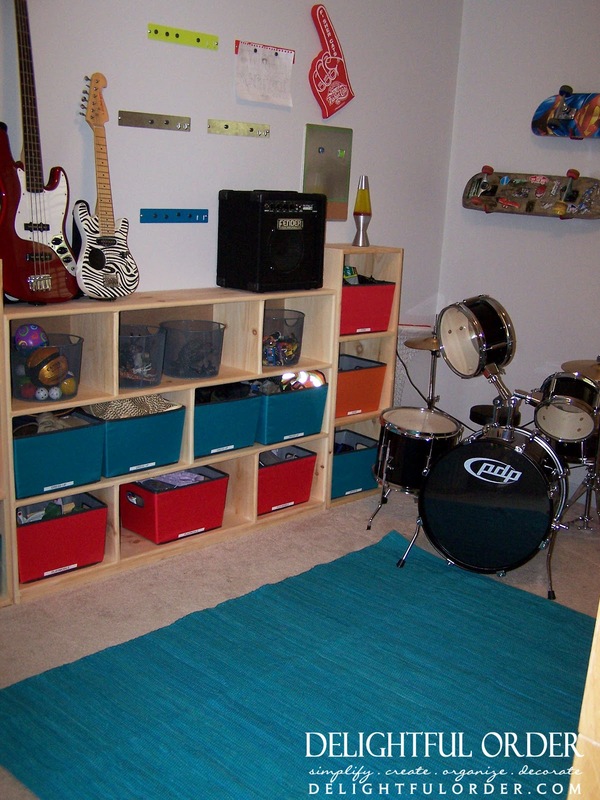 A couple weeks back, while visiting my family, my sister wanted to organize and re-do her boys' room. Oh, I LOVE an organizational challenge, so I totally dug in. 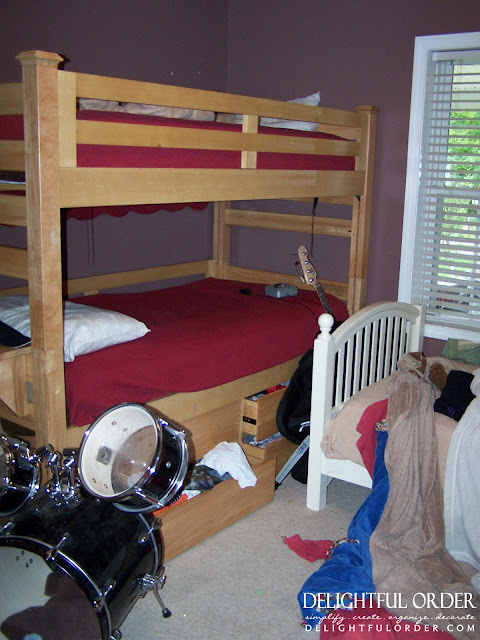 It isn't a very large room and her 3 boys all share the same room. 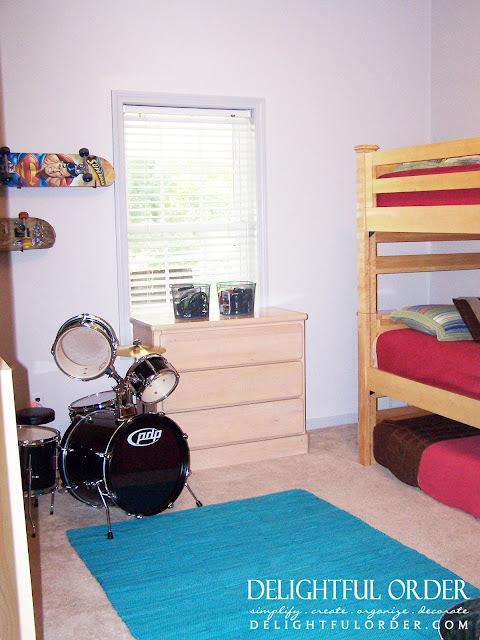 So to come up with a solution to store all their toys, their clothing and 3 beds was important. They have no playroom in the house, so toy storage was very important and was the main organization challenge/goal. 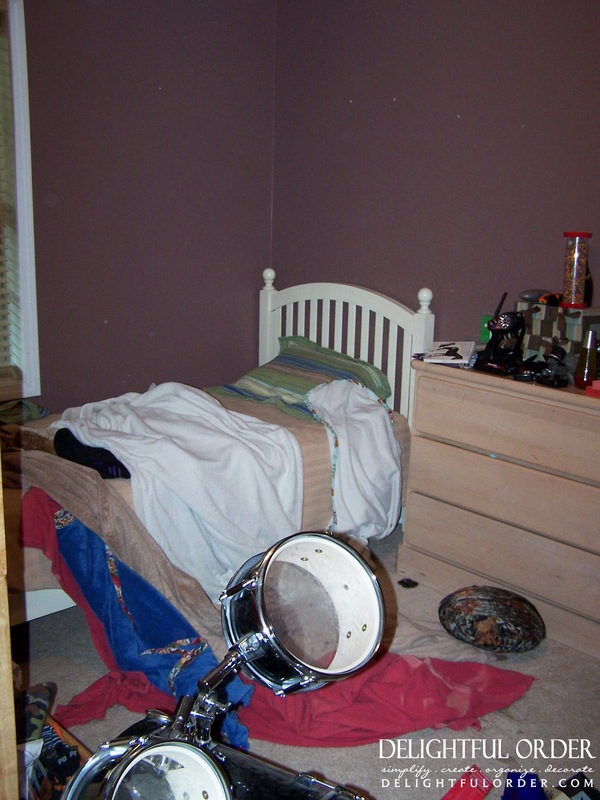 My nephews room is jammin' now, but it wasn't before my sisters and I tackled it. 3 beds in the room created a small space. When you walked into the room this is the first thing you saw. There was little space to move. In serious need of a little order, right? 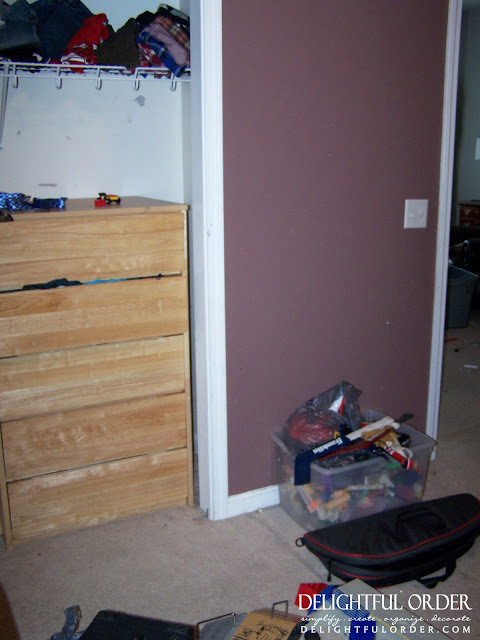 and this is AFTER I started digging in, going through toys and moving the dresser into the closet. Of course I forgot my camera before starting the project, so these before photo's are good compared to what it was. I actually had a lot of the toys moved out of the room already. 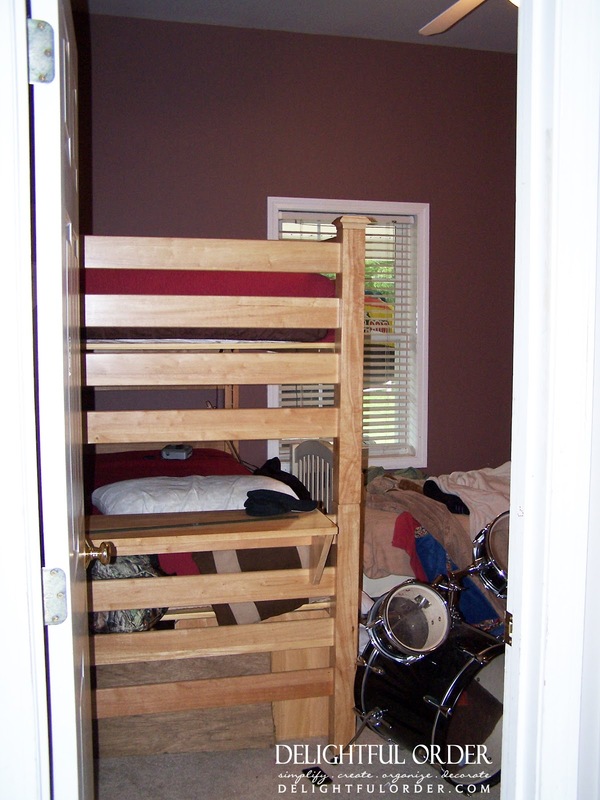 Move the bunk beds to the other side of the room. Get rid of the single bed. 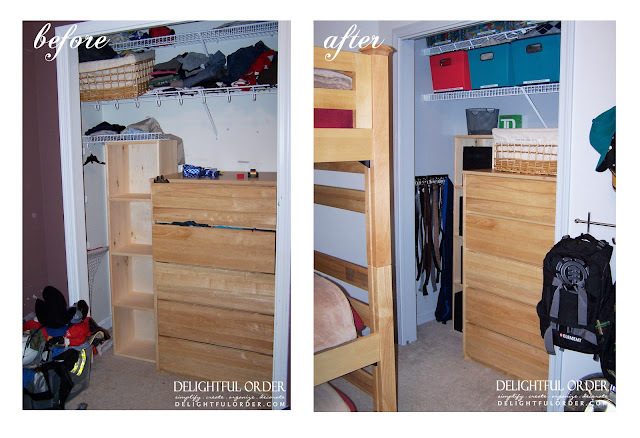 Keeping the bunk beds, BUT removing the drawers underneath the bunk bed. 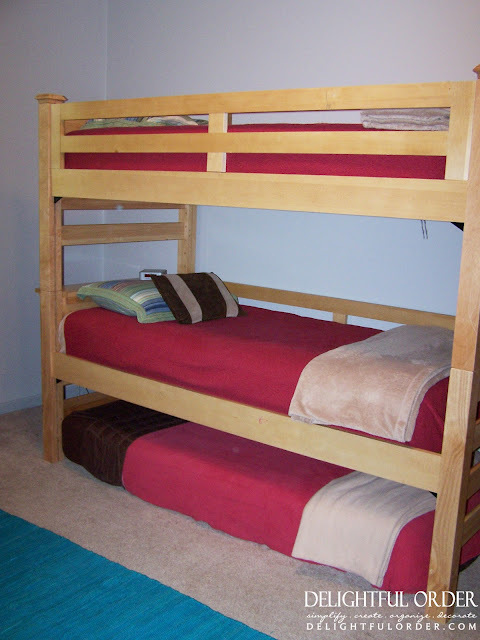 Remove those drawers under the bunks in order to create a trundle bed underneath, thus keeping the 3 beds in the room, but taking up much less space. 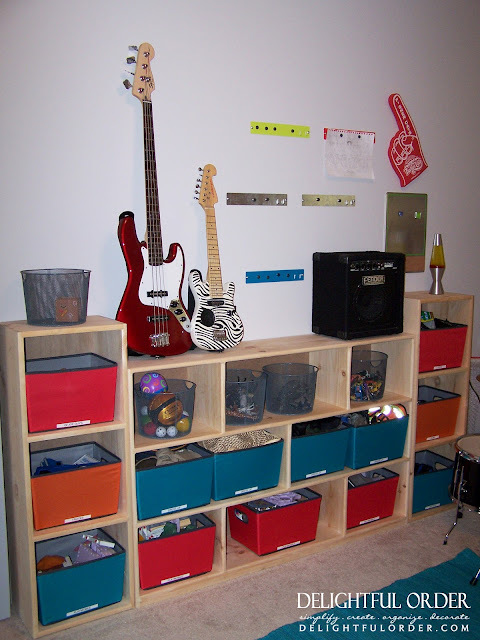 Creating an entire wall unit strictly for toys on the wall where the bunk beds now are. 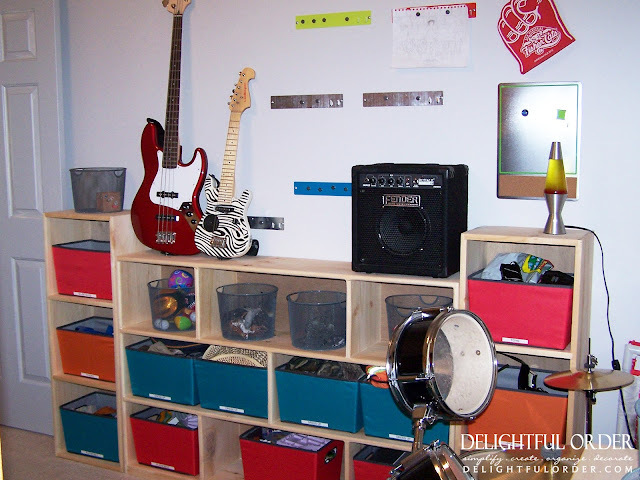 Adding baskets or bins to store toys inside the wall unit. Adding baskets or bins in the closet. 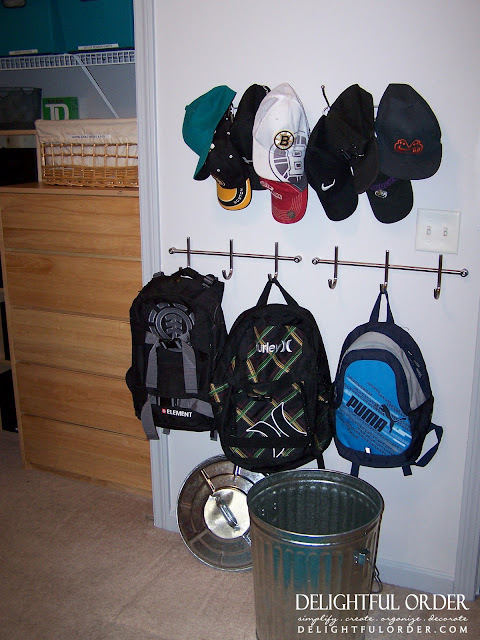 Adding wall hooks for backpacks, hats and belts. Paint the walls and the trim. With a list of all the items we would need, my 3 sisters and I went shopping. We had SO much fun! Cramming wall units and baskets and bins and 4 of us inside a small SUV. We only went to 2 stores, a woodworking store and Target. The next day, my sisters re-painted the entire room, including the trim. 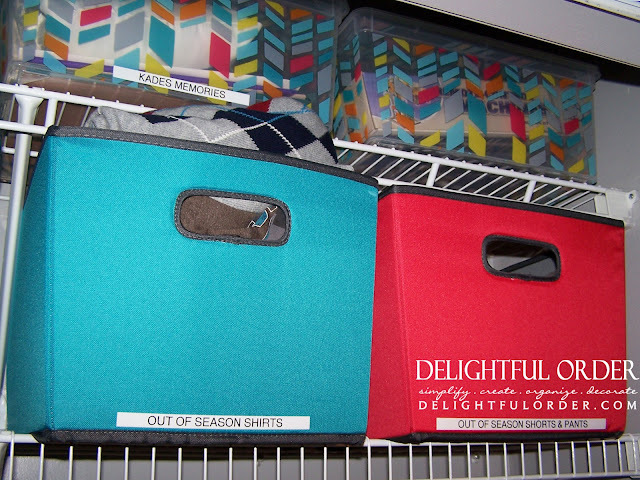 I did the organizing while the girls painted and here is how it all turned out. Here are the toys all organized! Awesome huh?! The boys had the guitars, skateboards and drum set. The metal magnetic things on the wall are from Target. These are there for the boys to hang their artwork, posters and such. The wall units are from a local woodworking shop. They are unfinished, my sister still needs to finish them. It's often times MUCH cheaper to buy furniture unfinished, if you don't mind spending a little time on them. All the baskets are from Target. For some reason the walls and the trim look purple in the photo's, BUT I can assure you they are not. They are GRAY. 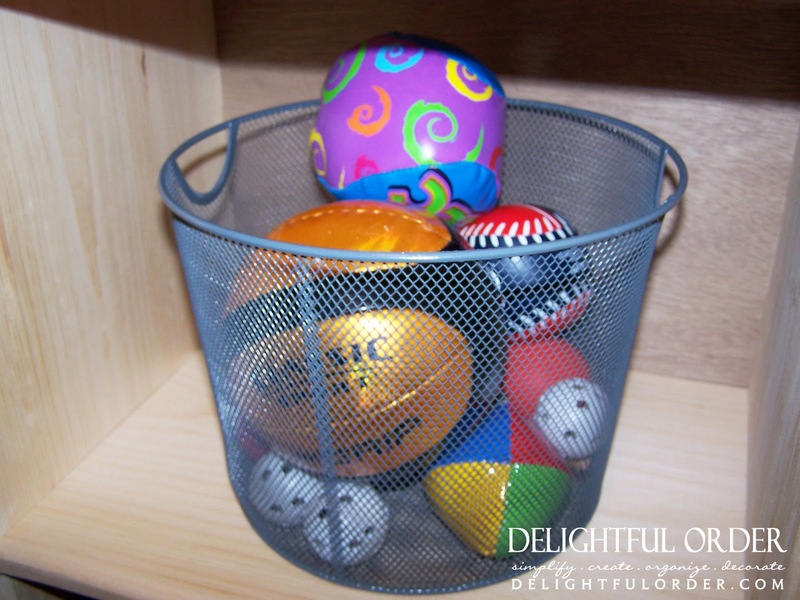 These baskets are from Target. We found them right up front when you first walk into Target. They were 2.50~ not bad at all. Here are the beds, moved to the other wall. My sister still has to find a trundle bed to go underneath the bunk, so the mattress can slide out easily. The rug is from Target as well. 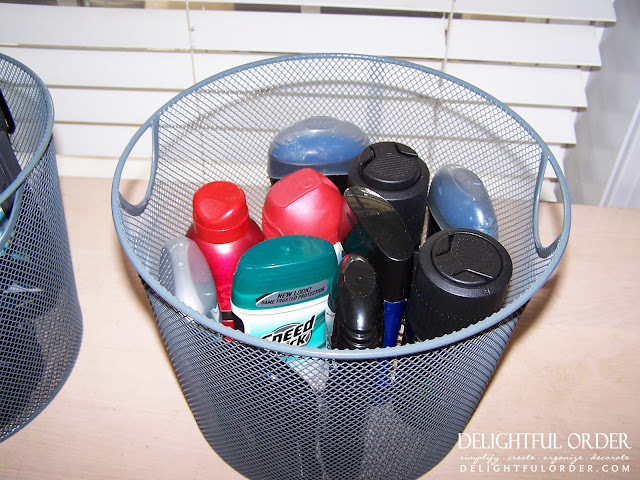 The metal garbage can is used as a dirty clothes basket. This was my sisters idea and I LOVE it! All of these hooks are from Target. and so are all of these bins. On the top shelf of the closet are bins filled with the boys' memories and the next shelf holds out of season clothing. 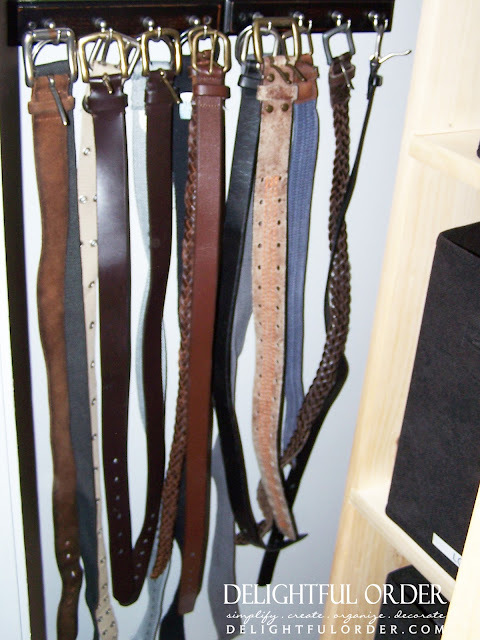 A couple of key ring wall hooks make great belt storage. These too are from Target. I'm seriously LOVIN' all the changes and I know my sister and my 3 awesome nephews are too. Make sure and ENTER our current giveaway going on now. 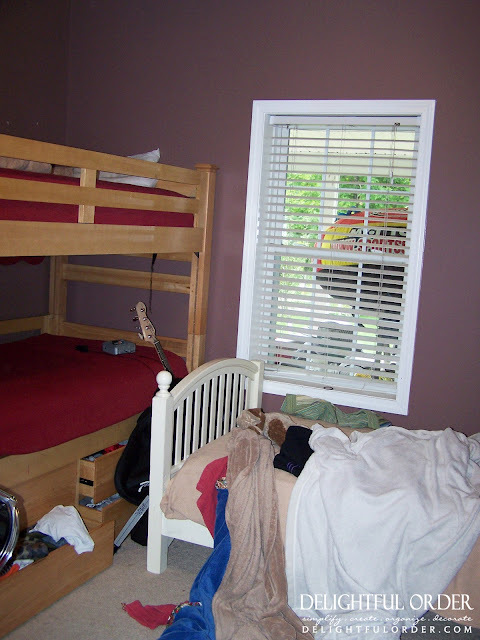 One of the boys clothes are in the dresser that is in between the beds and the drum set, the second boys clothes are in the dresser in the closet and the third boys clothes are in the cubbie unit in the closet next to the dresser, organized in the black bins. I love the changes and sure wish you were my sister! But my biggest question is, how much did it all cost? I love all your organizational suggestions, but it all looks seriously expensive. Good question. My sister did spend quite a bit on the bins and the wall units. 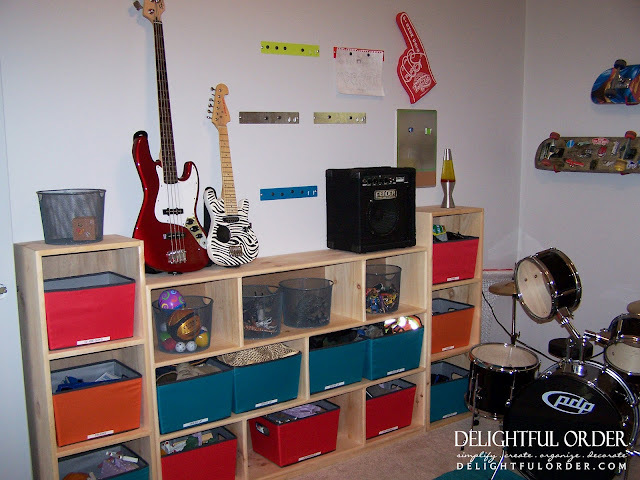 You could do something like this much more inexpensively, especially if you have old bookcases (or even getting inexpensive ones and painting them)and shopped at the Dollar Tree or even Walmart for bins. Targets baskets and bins tend to be a little pricey. Hope this helps some. Great re-do! Great Target buys. 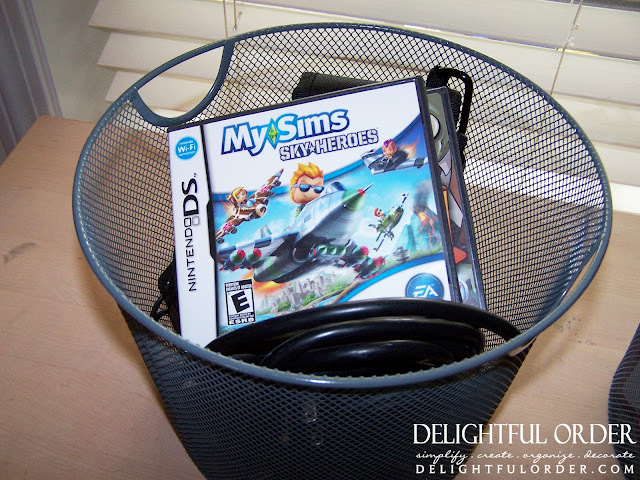 I'm sure the boys will enjoy being able to find everything easily. Awesome! One question: Do they not hang any clothes? Where is it all? Sorry, I totally should have explained this in the post. One of the boys clothes are in the dresser inside the closet. The second childs clothes are in the organized bins on the tall cubbie shelf in the closet and the 3rd ones are in the dresser in between the bunk beds and the drum set. My sister does not hang any of the boys' clothing. 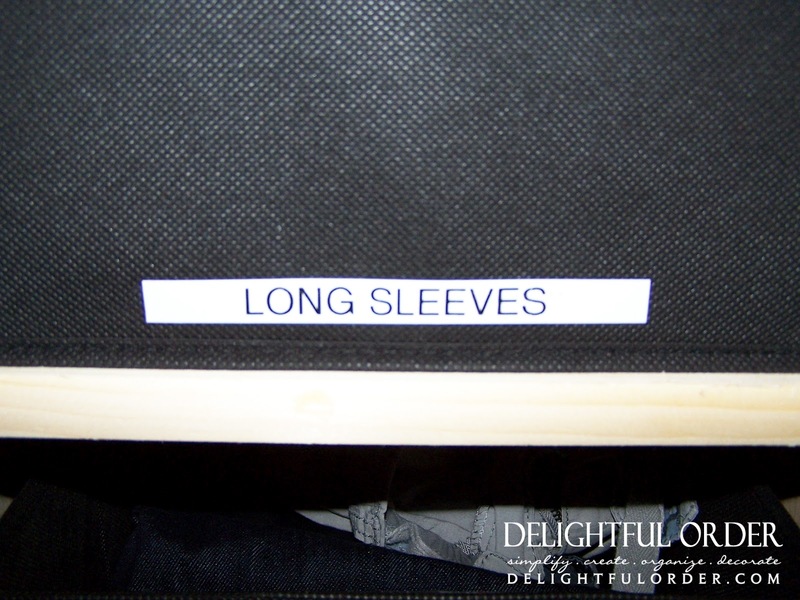 We are ever so grateful for Delightful Order! I can assure you that the boys and I are loving their new room! 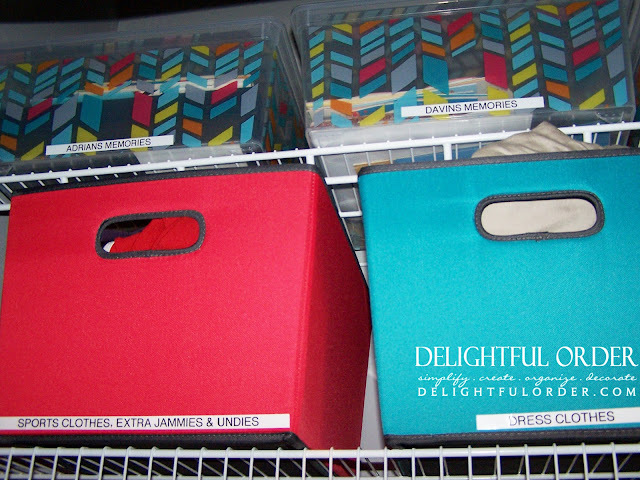 Yes, it has stayed neat and organized too! Thanks a million times over! :).... Sisters are the BEST! I have 3 boys in one room, too. My problem is their clothes! Where and how does she store them all? Are they all really in that one dresser?? 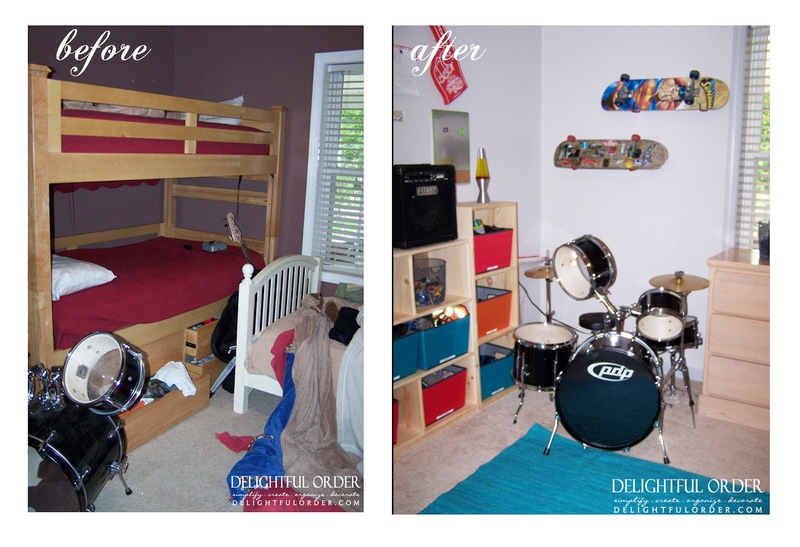 Having had 3 boys I would have loved this bedroom. I loved the heavy duty hooks and the trash/clothes hamper--great idea. Just a comment about clothes. I had 6 children in a very small house. They had very few clothes, so no need for multiple chest of drawers. I did laundry daily. We wore clothes out. While this would not work for everyone it did for us. Each child had a couple of darling outfits and they were either in the wash or being worn. I didn't have the luxury of hand me downs etc. But this simple ststem worked for us-I still use if for my self. I don't love to shop so when I do shop I buy a few cute outfits and wear them often. 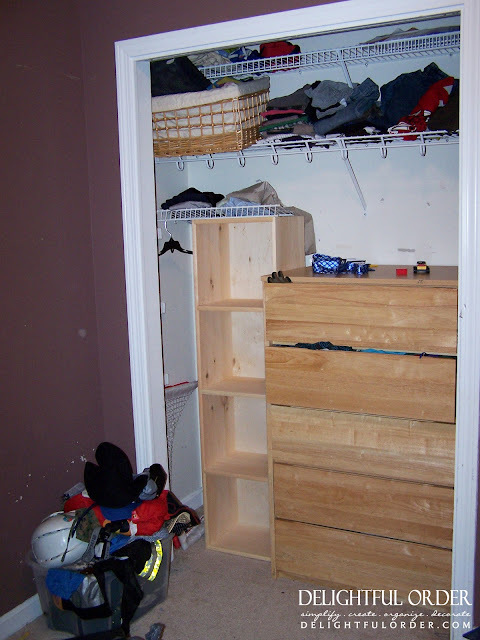 I have a very small closet and it isn't full. Shoes and jewelry is another story! It looks so good. You can tell a lotta work went into that. Good job. For an inexpensive trundle, use 2x4s,plywood and wheels. It could be trimmed out to match the bunk. Just a thought. What a Fabulous IDEA! My sister would LOVE that, I will pass it on. Thanks for sharing. My "boy" will be 20 next month and is away at college now. 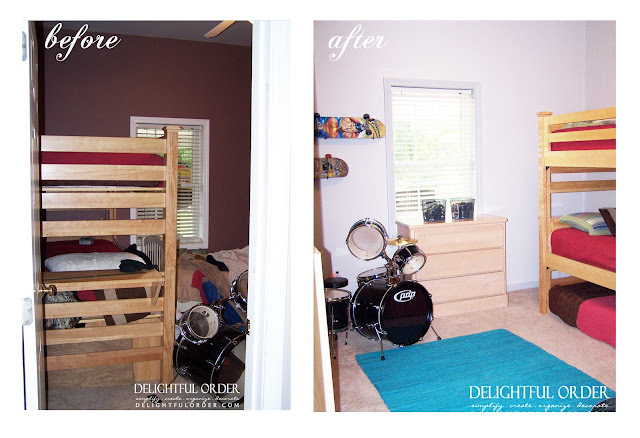 :( I love this room makeover! 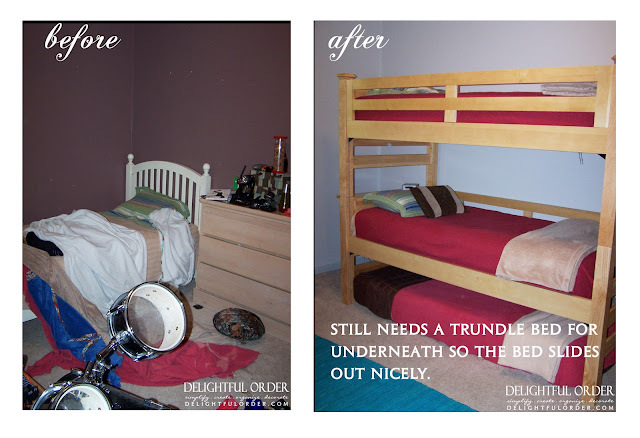 The trundle bed is a great idea, and I love the idea of a trash can for their laundry hamper...how cute and perfect for boys! Great job girls! You are just amazing. Have you ever thought of adding Bloglovin as a way of having others follow you? I am following you on twitter and pinterest, and liked you on facebook. I am following so many blogs on GFC I use bloglovin to stay connected to my most favourite. Just a thought. It looks great! 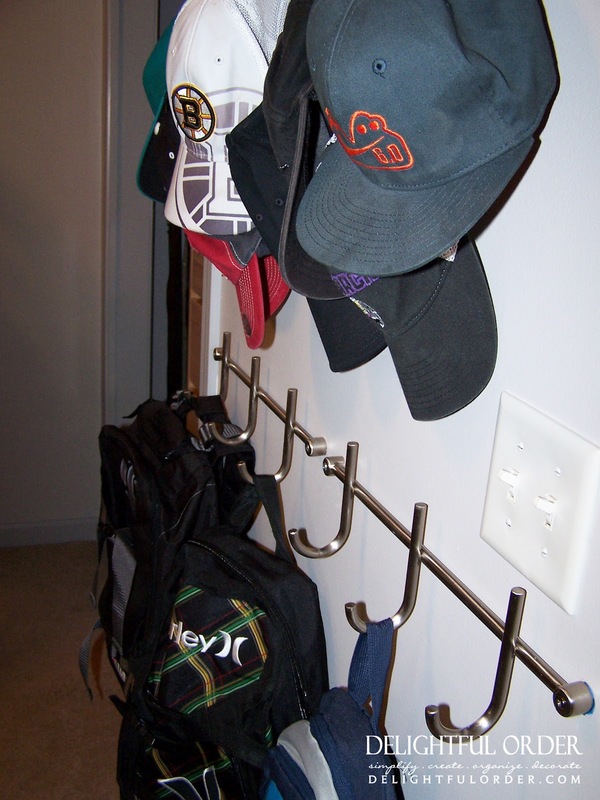 I think the metal trash can is a great idea for dirty clothes and I love all the little organizing tools you put into place - the key ring/belt storage, a place for the out of season clothing and backpacks and hats. I have 4 boys and you're so right on when you told your sister you're going to be checkin' up on them. Boys tend to let things like being neat and tidy slide. This is my first visit to your blog. It looks like a "delightful" place.